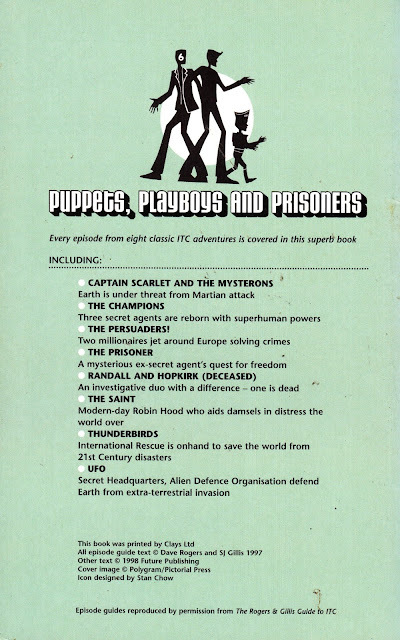 From 1998: PUPPETS PLAYBOYS AND PRISONERS, the slim paperback devoted to the ITC shows of the Sixties and early Seventies presented free with CULT TV magazine. Unlike the specially commissioned episode guide books published for SFX magazine, the CTV equivalent (presumably reflecting a more modest budget for commissioning freebies) was a straight forward and factual affair with no comment or commentary on the individual episodes. Which makes it a lot less fun to read. The contents had actually first appeared in the fan-published book THE ROGERS AND GILLIS GUIDE TO ITC, the sort of old-fashioned reference book that flourished before the combining of the web. I have a copy on my shelves somewhere. The two SFX episode guide books still occasionally surface in secondhand book stores but this one, perhaps reflecting CTV's lower sales, seems to appear far less frequently. Future Publishing certainly had better freebies than the far more frugal Visual Imagination.